On the occasion of our 30th anniversary, we are grateful to the banking leaders and their work who founded the Hungarian Banking Association in 1989. With the step they took, the Hungarian banking sector was able to reestablish its own advocacy group after forty years of forced suspension. In the past few decades the Hungarian Banking Association became a well-known and definitive professional advocacy institution. Its activities cover the entire financial sphere and its domestic and international involvement has become indispensable in the field of advocacy, cooperation for economic development and the raising of financial awareness. The Hungarian Banking Association has become the “voice” of the Hungarian banking sector that people expect to, from time to time, publish guiding opinions, resolutions on both domestic and international economic changes. These days worry mixes with trust when we speak about Europe’s economic and financial developments. Despite the challenges we face, we still must represent our fundamental interest, which is for the European Union’s economy to grow, for the Union to strengthen and for all those nation states which are part of it geographically, economically and culturally to find their homes within it. It is based on sustainable economic growth that our sector’s fundamental interest is to moderate the uncertainties and detrimental consequences of BREXIT. This is also the reason why we support that our neighbors from the South should enter the EU as soon as possible. It is the common interest of the nation states of a unifying and growing European economy to play a definitive role in the development of the world economy. Here we must emphasize that the banking sector can ensure the growth of the European economy through the role it plays in individual countries and its existing liquidity. At the same time the foundations for increasing our regional and international competitiveness can only be laid down by an efficient and unified European regulatory environment. Amidst the many extraordinary challenges of the past few years, the President of our Association, Mr. Mihály Patai, has quoted a Bible-derived expression for cyclical development several times: the seven years of famine and the seven years of plenty. The first period not only burdened the sector with many types of loss, but also, lacking the necessary sources, developments that would have been necessary lagged behind. The banking sector concluded a successful year in 2018. At the current state of the cycle, hopefully at the beginning of an upward trend, we must make up for what has been delayed both in terms of development and efficiency. This is the only way we can provide the necessary impulses to aid the development of sustainable economic growth in the age of digital transition. We cannot forget our seven years of famine, since on the one hand the true balance sheet is derived from the evaluation of both halves of the cycle, while on the other, lessons from society may greatly help new regulations to improve competitiveness, and with it, sustainable growth. The upcoming period will concentrate on the digitalization of banking services. The entire banking sector is preparing to grant all the innovative services that can provide the customer experience through a truly safe IT interface. The banking sector is preparing to take the lead in the market as the provider of safe financial services, and the foundations for this endeavor will be its commitment to innovations, the capital power of the sector and its comprehensive experience in IT and knowledge about its customers. Today, the Hungarian banking sector is in the forefront internationally in customer safety, and this will continue to be so in the digital age. From the point of view of customer safety, it is also important that the regulator provide the same conditions and establish the same requirements for both the old and new, the classic and the innovative actors of the market. As part of the anniversary program series, the Hungarian Banking Association’s Golden Beehive Awards were awarded to upper leaders who have played a significant role in developing the banking sector and to professionals who performed outstanding work for the Banking Association. Mr. László Wolf, Deputy Chief Executive Officer of OTP Bank. Mr. Szabolcs Pintér, Chief Accountant at Bank of China. *After the Financial Leaders’ Forum at MKB Bank, OTP Bank invited the delegates from 13 countries, the government and central bank representatives and the Hungarian bank leaders to a Gala Dinner, where they were welcomed by Ms. Andrea Bártfai-Mager, Minister without Portfolio for the Development of Public Assets, and Mr. Gergely Gulyás, Minister of the Prime Minister’s Office. On the second day, the morning of April 5th, the sector organized an international conference with the support of OTP Bank, where Mr. Balázs Rákossy, State Secretary for the Utilization of EU Funds at the Ministry of Finance, and Mr. László Windisch, Deputy Governor of Magyar Nemzeti Bank (the Central Bank of Hungary) both held presentations. Presentations were also held by guests from the Hungarian and the international banking sectors, by Mr. Sándor Csányi, Chairman and CEO of OTP Bank, Mr. Mihály Patai, President of the Hungarian Banking Association, and Mr. Wim Mijs, Chief Executive Officer of the European Banking Federation. After this, the delegates from the European banking associations consulted on cooperation between Europe and Asia with Mr. Yang Zaiping, Secretary General of the Asian Financial Cooperation Association (AFCA). The Asian Financial Cooperation Association (AFCA) is one of the most significant regional non-governmental and non-profit organizations in the financial industry. This cooperation platform is devoted to building economic and financial connectivity with Asia, aims to facilitate joint governance with shared benefits and places it in global perspective. The Hungarian Banking Association is one of its founding members and a well-known European representative of AFCA. 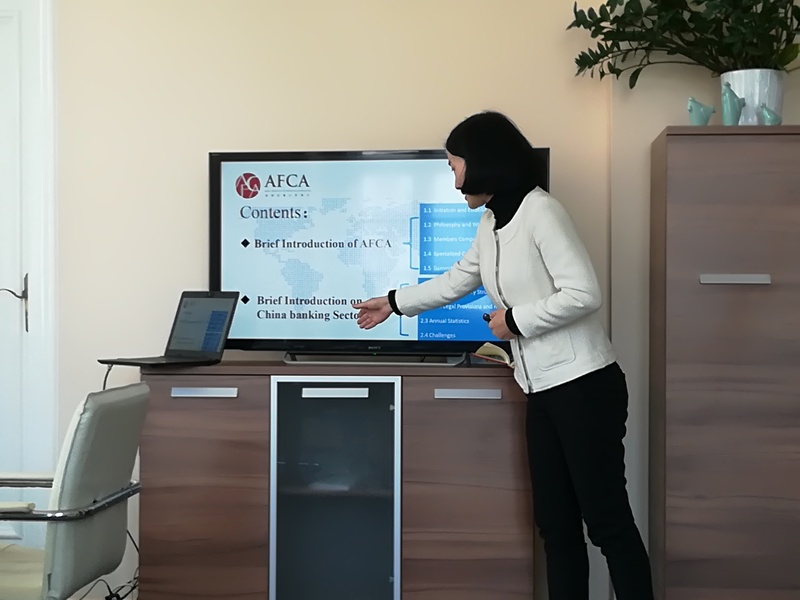 In order to exchange experiences, strengthen the integration of financial resources and enhance international cooperation, Ms. Li Wen, Business Supervisor of AFCA came to work with us in Budapest for a longer period. 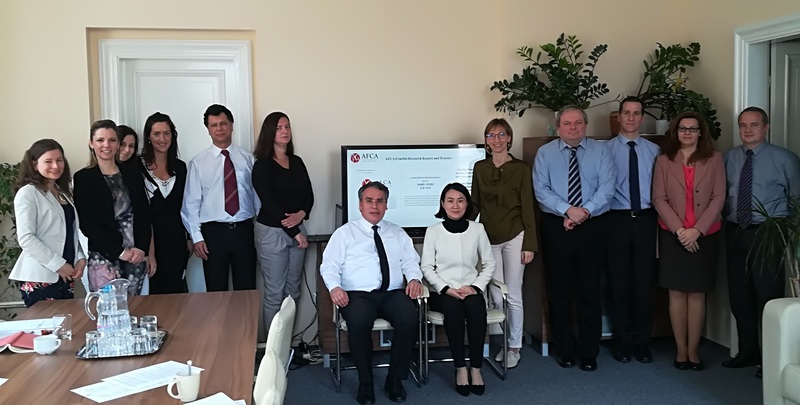 We hope that as the result of the staff exchange program, the Hungarian Banking Association and Hungary will be able to play a more significant role in the success of the Belt and Road Initiative, and that AFCA and the HBA will be able to develop an even more fruitful connection. 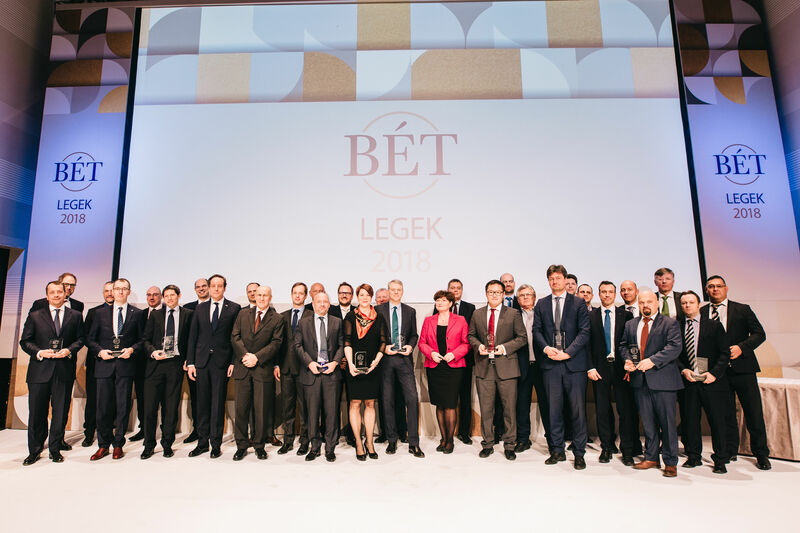 The BÉT Legek (Best of BSE) Awards Gala is one of the key events for the Hungarian capital market, which this year recognized outstanding performances on the stock exchange in 2018. 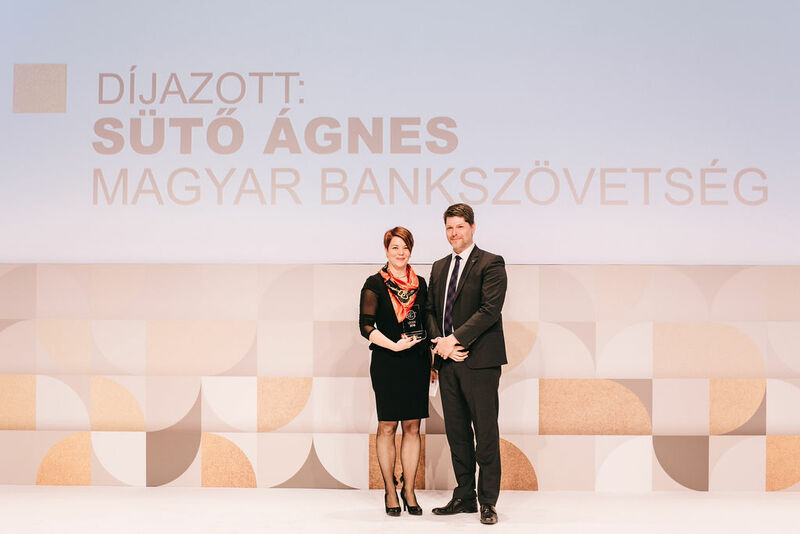 In January, the Hungarian Banking Association’s employee, Ágnes Sütő, Deputy Secretary General, Communications received the Investment Literacy Award. The laudation mentioned Ms. Sütő’s enduring achievements in adopting the Hungarian program series (PÉNZ7) from the European Banking Federation’s International Money Week. Each year, the PÉNZ7 program series reaches an exceptionally high proportion of students and teachers on a European scale. The program’ organizers, the Ministry of Human Capacities (the project administrator), the Ministry for Innovation and Technology, the Ministry of Finance, the Hungarian Banking Association, the Money Compass Foundation, and Junior Achievement Hungary all collaborate in order to make PÉNZ7 as successful as possible. Ms. Sütő, winner of the award, is also the curator of the central bank’s Money Compass Foundation and has played an essential role in making this exemplary, cross-sectoral and trans-professional collaboration possible. For nearly twenty years, the Budapest Stock Exchange has held an annual ceremony, the “BÉT Legek” (Best of BSE) Gala, to recognize the best performances of the domestic capital market. A panel consisting of the members of the Stock Exchange Advisory Board decides on award recipients. In most of the categories, winners are selected on the basis of a quantitative methodology (for example, turnover data). In the case of the Online Trading Platform of the Year and the Financial Literacy Award, the winner is chosen after evaluating the entries received and - it the case of the former - on the basis of user ratings as well. Over 100 cases of phishing are reported in Hungary each month according to statistics by authorities and corporations. This number, however only represents a fraction of the actual frauds committed: it is estimated that the number of people who fall victim to telephone and online fraud every year is among the thousands. Domestic market actors (credit institutions, telecommunication companies and utility service providers) apply advanced defense systems against phishers and alert their customers when they realize that fraud is being committed. Still, we must always pay just as careful attention to the money on our bank accounts as to the money in our wallets. With the aid of their joint press event and statement, the Hungarian Police Headquarters, the Hungarian Banking Association and the National Cyber Security Center would like to emphasize that preventing cyber crime is a common social interest and task. 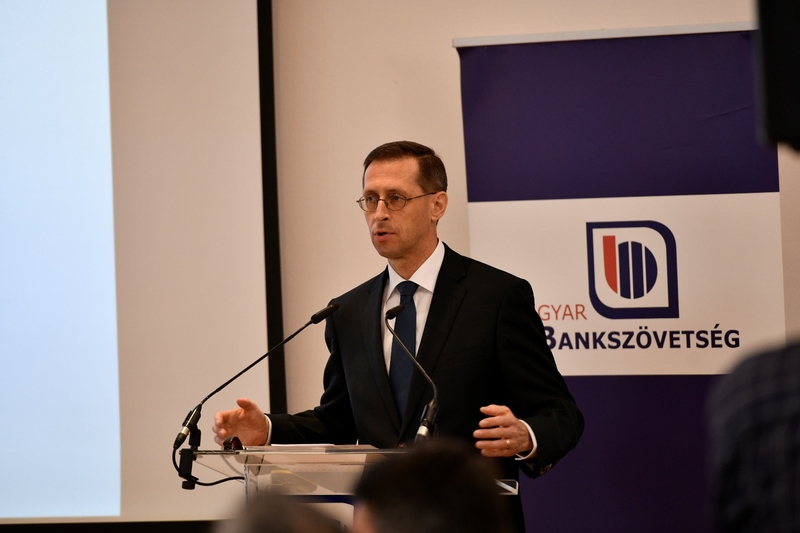 On 20 April 2018, the Hungarian Banking Association held its annual General Meeting, attended by the CEOs of financial institutions, as well as Mihály Varga, Minister for National Economy and Deputy Governors of the National Bank of Hungary: Ferenc Gerhardt. 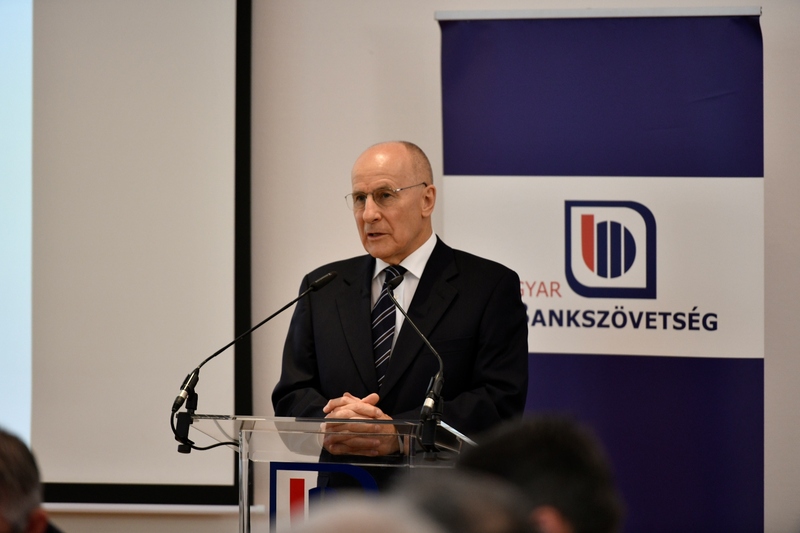 The General Meeting commemorated Mr Zoltán Urbán, Member of the Hungarian Banking Association’s Board and former CEO of Eximbank, who had passed away tragically and unexpectedly. The General Meeting elected Tamás Bernáth (MFB - CEO) as the new Member of the Hungarian Banking Association’s Board. We can report that after a long and difficult period following the year 2008, in 2017 the Hungarian banking sector closed an outstandingly good year. Last year’s profitability fits in with international and regional trends. The profits realised typically went into profit reserves, which, due to more intense lending activities, support the accelerating growth of the economy. The foundations of the banking sector’s positive results were laid down by the sector’s stable operation and the favourable evolution of lending costs. At the same time, keeping up with the dynamic rate of technical evolution and changing customer needs requires on-going rejuvenation, adaptation and innovation on the part of the sector’s players. ‘The banking sector can only serve the economy’s development in an economic environment offering predictable legal, taxation and governance conditions, and other economic players also expect a similar environment. Therefore, in our relationship with the legislator and the authorities, we continue to place the emphasis on co-operation and scrupulous professional discussions.’ – explained Mihály Patai, President of the Hungarian Banking Association. All players in the Hungarian banking sector support the key joint objective of strengthening continuity and predictability in financial policy. This can ensure the successful short-term and long-term operation of businesses and creditors alike. After the dynamic utilisation of EU funds, a new era is approaching, where each economic player is compelled to find the competitive development path that will determine its future. The domestic banking sector has sufficient capital strength and liquidity for funding any necessary reorganisation and developments. the abolishing of all forms of taxes and levies imposed in respect of free banking services (such as the free cash withdrawal allowance of 150 thousand HUF/month). The Hungarian financial market is part of the European and global markets. At times when protectionist trends also threaten the Hungarian economy, the assertion of our interest can only be achieved subject to the harmonised development of the European Union and the deepening of economic integration, and therefore we are committed to these objectives. We also believe that the conclusion of Brexit negotiations in a way that allows existing economic connections to be retained, is to be commended. In terms of global bank regulations, we consider the globally consistent application of regulations desirable, to ensure that the development of the European Union’s financial system and the extension of its economy can take place free of competitive disadvantages, in a sustainable manner. Attila Rankó (Deutsche Bank) for his outstanding professional activities in the area of payments and in the adaptation of European banking regulations. This content is only available in Hungarian. On May 12 ,2017 the Hungarian Banking Association held its annual General Meeting, which, next to the CEOs of financial institutions, also hosted guests Ágnes Hornung, Secretary of State at the Ministry for National Economy and the Deputy Governors of the National Bank of Hungary. At the General Meeting, elections were held for each member of the management. We can report about the year 2016 with confidence that the positive signs of a turning trend are already showing, which can be a stabilising, what’s more, invigorating factor in the growth of the local economy. This is of special significance, given the fact that the financial sector has been suffering significant losses since 2008. As a result, internal cost levels were reduced to exceptional levels. At the same time, cost-cutting was marked by the transaction levy, booked as cost, as well as the exceptionally high level of special taxes. In the last decade, this went hand-in-hand with the inevitable postponement of numerous investments. In 2016, the improvement of the economy in general, along with market recovery, created a one-off opportunity to cut back on bank provisions. The sale of card company stocks and dividends originating from foreign markets created revenues that were significant at sector level, but were also one-time or unique in nature. ’In response to market and innovation challenges, in the following years the banking sector will implement significant IT developments and investments. At the same time, banks will also have to maintain tight cost control, which will result in moderate growth even in the medium term, falling significantly short of the European average.’ – explained Mihály Patai, (RETIRING/RE-ELECTED) President of the Hungarian Banking Association. The activities of the banking sector are characterised by a constructive evaluation of past events and a positive outlook, as well as intense competition not only on the domestic market but also in an international context. Hungary’s international position and its regional significance require the extension of both production and international co-operation, for which the banking sector can provide the development resources required. At the same time, the bilateral confidence structure of financing necessitates the reinstatement of the banking sector’s reputation, which is the responsibility of all decision-makers. To be able to support the fast and plannable development of the economy, financing entities also need a predictable regulatory environment. This involves the reduction of special taxes to European levels, the abolition of the transaction levy and the drafting of legislation offering mortgage lenders the possibility to enforce their rights in an appropriate manner. The latter requires that changes are based on impact analyses, and are pre-planned and pre-agreed. Digitalisation changes the services offered by financial institutions at an unprecedented rate. The costs of digitalisation developments will stay with the banking sector as key cost items for many years to come, while the effects of income / cost reduction will only be felt in the longer run. Digital progression can only be achieved in a safe manner if developments take place to the extent of real customer requirements, and in line with any changes in these. For this, as a core condition, we rely on deeper and more intense professional co-operation in both the Hungarian and European legislative process, and also in banking supervisory activities. We believe that human resources essential for such developments can be ensured by reducing bureaucracy and the administrative burden. World economy is undergoing a process of change, and new challenges are diverse. It is the partnership and financial co-operation of the European Union and the North American economic zone – the world’s two most developed economic regions – that will ensure appropriate living standards and offer the possibility of on-going development. Therefore, boosting the international role the European Union plays is in our shared interest – and therefore is also in the interests of Hungary. Over the past years, the financial role of China has taken on a new dimension, while Russia’s influence in world matters has not diminished. By showing mutual respect for our differing historical development paths and cultures, we will see further economic and financial opportunities open, on the grounds of dialogue and shared interests. The continued organic development of the global economy and financial markets requires that key representatives of the world economy work in close co-operation. This can be significantly helped by international bank groups with a long tradition, which pursue intense activities in key countries of the world, and also locally, in Hungary. As representatives of our sector, we must take a position on the direction and speed of Europe’s economic progression. International bank groups serve the entire European retail and business clientele along the same principles and in the same quality, also taking local requirements into consideration This also proves that Continental Europe can only be a strong, influential and stable area from an economic and financial aspect if it can ensure that and reduce, and in the long term eliminate the economic disparity still hindering progress. European international bank groups can facilitate this economic progress, which helps the elimination of disparity in the long term, by collecting funds, facilitating money flows and offering credit. In doing so, they have shared interests with financial institutions in Hungarian ownership, which also offer services to European standards, motivated by the sustainable development of Hungary, which is both their objective and a pre-condition to their existence. The Hungarian Banking Association elects a new management once every three years, for which the time has come at the present General Meeting. At the General Meeting the Hungarian Banking Association HAS ELECTED XY AS ITS PRESIDENT/re-elected Mihály Patai, as its President; and HAS ELECTED/RE-ELECTED XY/András Becsei as its Vice President; XY/Henrik Auth as Chairman of its Ethical Committee. For the next three years, the following Board Members have been elected: XY/ Éva Hegedűs, Radovan Jelasity, Pál Simák, Zoltán Urbán, György Zolnai /XY. • Gábor Weissmüller (Citibank) – for his high-quality professional contribution to the prevention and combating of financial fraud.